The southbridge is an IC on the motherboard responsible for the hard drivecontroller, I/O controller and integrated hardware. Integrated hardware can include the sound card and video card if on the motherboard, USB, PCI, ISA, IDE, BIOS, andEthernet. The southbridge gets its name for commonly being South of the PCI bus. 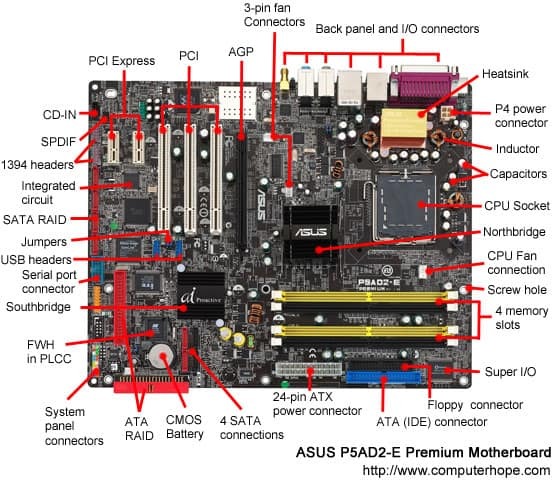 Below is a graphic illustration of the ASUS P5AD2-E motherboard and some basic explanations of each of the major portions of the motherboard including the southbridge. As shown in the picture below, it is common for the northbridge and southbridge to have a heat sink; in addition, the northbridge is usually slightly larger than the southbridge. Although the southbridge handles most of the I/O devices, less prominent input/output devices, such as a serial port, keyboard, and non-USB mouse are handled by the super input/output (SIO). Note: New motherboards are replacing the northbridge and the southbridge with IHA. Alternatively referred to as the PAC (PCI/AGP Controller) and nb, the northbridgeis an integrated circuit responsible for communications between the CPU interface,AGP, and the memory. Unlike the Southbridge the Northbridge is directly connected to these components and acts like a “bridge” for the Southbridge chip to communicate with the CPU, RAM, and graphics controller. Today, the northbridge is a single-chip that is North of the PCI bus, however, early computers may have had up to three separate chips that made up the northbridge. Below is a graphic illustration of the ASUS P5AD2-E motherboard and some basic explanations of each of the major portions of the motherboard, including the northbridge. As shown in the picture below, it’s common for the northbridge and southbridge to have a heat sink; in addition, the northbridge is usually slightly larger than the southbridge and is the closest to the CPU and memory. When the CPU needs data from RAM, a request is sent to the northbridge memory controller. After the request has been received, it responds with how long the processor need to wait to read the memory over the front side bus (FSB). Some newer motherboards have replaced the northbridge and the southbridge with IHA. As manufacturers look for new ways to improve performance and lower the overall cost they are moving the functions of the northbridge chip to other parts of the CPU and southbridge. Beginning with the AMD64 AMD and the Intel Nehalem processors the memory controller was moved from the northbridge to the processor die. Later, the Intel “Sandy Bridge” and the AMD Accelerated Processing Unit processors placed all northbridge functions onto the CPU.